Prudhoe Bay Oil Field is a large oil field on Alaska's North Slope. It is the largest oil field in North America, covering 213,543 acres (86,418 ha) and originally containing approximately 25 billion barrels (4.0×109 m3) of oil. The amount of recoverable oil in the field is more than double that of the next largest field in the United States, the East Texas oil field. The field is operated by BP; partners are ExxonMobil and ConocoPhillips Alaska. The field is located 400 miles (640 km) north of Fairbanks and 650 miles (1,050 km) north of Anchorage, 250 miles (400 km) north of the Arctic Circle, and 1,200 miles (1,900 km) south of the North Pole. It is on the North Slope and lies between the National Petroleum Reserve–Alaska to the west and the Arctic National Wildlife Refuge to the east. The State of Alaska owns the land and leases the area as the Prudhoe Bay Unit. In the terminology that the State of Alaska uses in its leasing program, the "Prudhoe Bay Oil Field" is called the Prudhoe Bay Oil Pool. Oil pools within the Prudhoe Bay Unit include the following - maps showing the location of each pool are in the associated reference. A map of northern Alaska; the dotted line shows the southern boundary of the North Slope. The National Petroleum Reserve -Alaska is to the West, the Arctic National Wildlife Refuge to the east, and Prudhoe Bay is between them. Red lines are pipelines. 1971 aerial photo of the oil fields by the United States Fish and Wildlife Service. Roger MacBride touring the oil field facilities during his 1976 presidential campaign. North Slope oil production peaked in 1989 at 2 million barrels per day (320×10^3 m3/d) (Greater Prudhoe Bay: 1.5 million barrels per day (240×10^3 m3/d), but had fallen to 943,000 barrels per day (149,900 m3/d) in 2005,  while Greater Prudhoe averaged 411,000 barrels per day (65,300 m3/d) in December, 2006 and Prudhoe itself averaged 285,000 barrels per day (45,300 m3/d). Total production from 1977 through 2005 was 11 billion barrels (1.7×10^9 m3). Oilfield facilities at Prudhoe Bay. On March 2, 2006, a worker for BP Exploration (Alaska) discovered an oil spill in western Prudhoe Bay. Up to 6,400 barrels (1,020 m3) were spilled, making it the largest oil spill on Alaska's north slope to date. The spill was attributed to a pipeline rupture. The March 2006 oil spill led the United States Department of Transportation to mandate that the transit lines be inspected for corrosion. As a result, BP announced on 6 August 2006 they had discovered severe corrosion, with losses of 70 to 81 percent in the 3/8-inch thickness of the pipe walls. Oil leaking was reported in one area, with the equivalent of four to five barrels of oil spilled. The damage required replacement of 16 of 22 miles (35 km) of pipeline at the Prudhoe Bay. BP said it was surprised to find such severe corrosion and that it had been 14 years since they had used a pipeline inspection gauge ("pig") to clean out its lines because the company believed the use of the pigging equipment might damage pipe integrity. BP Exploration announced that they were shutting down the oil field indefinitely, due to the severe corrosion and a minor leak in the oil transit lines. This led to an 8% reduction in the amount of oil produced by the United States, as Prudhoe Bay was the country's largest oil producer, producing over 400,000 barrels per day (64,000 m3/d). ^ Harball, Elizabeth (2017-06-24). "Alaska's 40 Years Of Oil Riches Almost Never Was". NPR. Retrieved 27 June 2017. ^ Ragsdale, Rose (2008-11-16). "40 Years at Prudhoe Bay: Young geologist changed Alaska history". Vol. 13, No. 46: Petroleum News. Retrieved 27 June 2017. ^ "NRHP nomination for Prudhoe Bay Oil Field Discovery Well Site". National Park Service. Retrieved 2015-03-25. ^ "BP Seawater Treatment Plant in Prudhoe Bay, Alaska". Youtube. ATEECEICC. Retrieved 25 May 2015. ^ "US Republicans set to turn Alaska's Arctic National Wildlife Refuge into oilfield". Bellona.com. 14 April 2005. Archived from the original on 26 November 2005. Retrieved 2006-08-08. 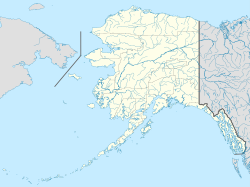 ^ "Alaska North Slope production breaks 800,000 bbl/d (130,000 m3/d) barrier". Petroleum News. 7 January 2007. ^ Margaret Kriz Hobson (April 3, 2013). "SHALE OIL: Geologist's Alaska gamble could turn into America's next big shale play". Energy Wire, E & E Publishing. Retrieved April 4, 2013. ^ Jones, H.P. ; Speers, R.G. (1976). Braunstein, Jules (ed.). Permo-Triassic Reservoirs of Prudhoe Bay Field, North Slope, Alaska, in North American Oil and Gas Fields. Tulsa: The American Association of Petroleum Geologists. pp. 23–50. ISBN 0891813004. ^ "Alaska hit by 'massive' oil spill". BBC News. March 11, 2006. Retrieved August 8, 2006. ^ Chittim, Gary (November 3, 2008). "Agencies respond to oil spill whistle blower". KING 5.com. Archived from the original on November 7, 2008. ^ "Biggest Oil Field in U.S. Is Forced to Stop Pumping". New York Times. 2006-08-08. ^ "BP shutting top US oil field Prudhoe Bay due to spill". Reuters. 7 August 2006. Archived from the original on 8 January 2007. Retrieved 2006-08-08. ^ Raft, Anna (7 August 2006). "BP restart of Prudhoe Bay oil field may take months". MarketWatch. Retrieved 2006-08-08. ^ "BP oil field 'closed until 2007'". CNN. August 8, 2006. Archived from the original on February 10, 2008. Retrieved 2006-08-08. ^ Loy, Wesley (7 August 2006). "BP shuts down Prudhoe Bay". Anchorage Daily News. Archived from the original on 2006-08-19. Retrieved 2006-08-08. ^ Loy, Wesley & Richard Richtmyer (August 8, 2006). "Massive repairs: BP admits corrosion control was inadequate, prepares to replace North Slope transit lines". Anchorage Daily News. Archived from the original on 2006-08-21. Retrieved 2006-08-08. ^ "BP to reopen oil pipeline in Alaska". The Scotsman. June 25, 2007. Retrieved 2007-07-10. ^ Bolado, Carolina. "Court Dismisses Alaska's Lost Taxes Claim Against BP". Law360. Retrieved 28 December 2014. Jamison, H.C., Brockett, L.D., and McIntosh, R.A., 1980, Prudhoe Bay - A 10-Year Perspective, in Giant Oil and Gas Fields of the Decade: 1968-1978, AAPG Memoir 30, Tulsa: American Association of Petroleum Geologists, ISBN 0-89181-306-3. Sweet, John M. (2008). Discovery at Prudhoe Bay. Blaine: Hancock House. pp. 312 pp. ISBN 978-0-88839-630-3.